Factory warranty, panaramic roof, Eco-Green Pearlcoat, Kuhmo AT tires, heated seats and steering! V6 Trailhawk - Remaining Factory Power Train Warranty until 03/16/2020 or 100k! This 2015 Jeep Cherokee Trailhawk V6 4x4 is a show stopper! Sharp Eco-Green Pearlcoat paint along with black trim accents make this Jeep a stand out! This Jeep Trailhawk is riding on thick Kuhmo RoadVenture AT tires and is loaded up with great options - panaramic sunroof, touch screen 9 speaker stereo, factory remote start, heated leather seats, heated steering wheel, navigation, back up camera and electronic rear locking differential! 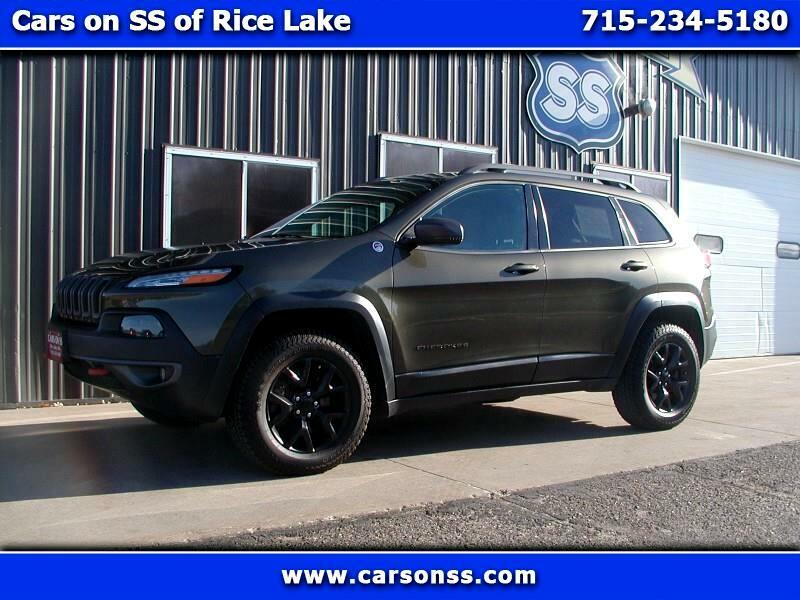 Check out this sharp Jeep Cherokee Trailhawk at Cars on SS of Rice Lake! Powertrain warranty per Jeep until 03/16/2020 or 100k - whichever happens first.